In the world of internet marketing, sending mass email remains to be a top choice when it comes to promoting a business. This strategy has been proven effective to reach targeted and potential customers in a simple, hassle-free and cost effective manner. The total cost of running an email marketing is significantly lower than other advertising methods. Best of all, companies can ask the help of third party mass email services to make the whole process a lot easier. Although sending an email blast can be accomplished through the use of public email service providers such as Yahoo, Gmail, Outlook, AOL and more, there are many reasons why one still needs the help of a professional third party mass email provider. From saving time and resources to controlling bounce rates, know more about these reasons below. Creating and handling your email list is extremely challenging. It requires a lot of time as well as effort to manually check, organize, import and export such a huge number of email addresses and consolidate it all into an email list. But with the tools provided by third party email services, creating, building and managing your database is easy via automation. The problem with public ISPs is that they usually have a limit to the number of emails you can send per day. Even if you have a powerful email, if it doesn’t reach your target recipients, everything is useless. Yet with professional mass email providers, you can overcome this limitation. Moreover, you can customize your budget either by paying a fixed monthly rate or using the pay-as-you-go option. Another reason why it is more advantageous to choose a best email marketing service is that you don’t have to worry about email designs, contents and templates. Especially if you are new to sending consumer emails, it is hard to create a well-designed email campaign that is compatible on mobile phones, tablets, laptops and other multimedia devices. But with third party mass email services, various selection of well-crafted designs, templates and even contents are all available for immediate use. It is perfectly fine to buy email lists, but this doesn’t guarantee 100% email delivery. What’s the point of buying 10,000 emails when 50% of those addresses are invalid? High delivery rate is important for the success of your campaign, and this is where third party mass email services are good at. By having strong relationship with various ISPs, their servers are classified on the internet as white list – meaning emails sent through them wont bounce nor be labeled as spam. Measuring the success of your mass emails is hard if you don’t have the right tracking tools available on hand. By choosing third party email services, they will give you tools to measure the number of emails received, emails labeled as spam (if there’s any), emails that were opened, conversion rates, bounce rates and all others. Market trends and analysis reports are equally given to improve campaigns. 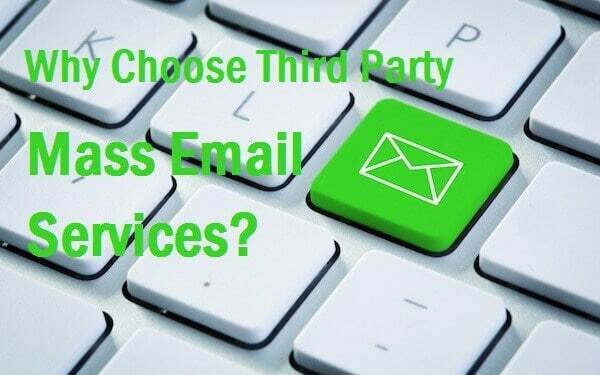 Whether you will be sending consumer or business emails, the role of third party mass email services is indispensable. Aside from helping you create powerful and conversion worthy emails, they will equally assist you on managing and executing effective campaigns.